Thunderstorms often strike with little warning, particularly during the warmer months when they are most likely to occur—and when we are most likely to be enjoying outdoor activities. Get inside the nearest available vehicle or building— keeping all windows shut—and stay there for at least 30 minutes after the storm passes before returning outside. Avoid picnic tents, pavilions or other open, outdoor structures. Avoid hilltops and open areas. Lightning always seeks the highest ground, so if indoor shelter is not available, crouching down in the nearest, lowest, unexposed point is a better bet. Being outside during a thunderstorm is never safe. 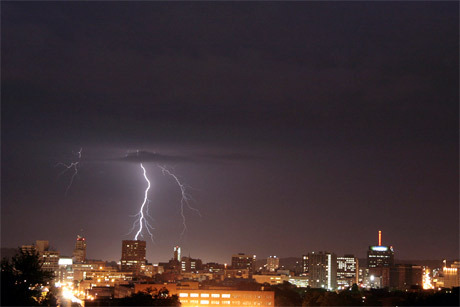 Lightning strikes accompanying these storms pose a serious threat to people and property. Always listen to weather reports when you have an outdoor activity planned, and reschedule if thunderstorms are in the forecast. Do not be lulled into a false sense of security if the storm is several miles away. In general, a significant lightning threat extends outward from the base of a thunderstorm cloud about 6 to 10 miles. Despite your best efforts, you may still find yourself caught outside as an unexpected thunderstorm approaches. In cases when a safe, indoor shelter is absolutely not available, here are some scenario-specific tips that may help lessen your chance of being struck by lightning. If you are nowhere near the clubhouse, move away from hilltops, open areas and water. Stay as far away from tall trees and metal conductors (like wires and fences) as possible. Move away from your golf cart and clubs. Try to maintain at least 20 feet of distance between you and other golfers on the course. Most lightning-related injuries and deaths on boats occur on vessels without a cabin. Larger boats with cabins are relatively safe, particularly when a lightning protection system is properly installed. If you cannot return to shore before the storm hits, drop anchor and get as low as possible or retreat to a cabin if your boat has one. Remember to stay off the radio unless there is an emergency, too. It is also a good idea to keep away from metallic surfaces, which may conduct electricity. Always avoid lone trees and other tall objects. Stay away from rocky outcrops, ledges, water and wet items like ropes and towels, too. If you are deep in the forest, retreat underneath a group of small trees, preferably surrounded by taller ones. In more open areas, retreat to and crouch down in the closest dry, low area. If you are swimming, get out of the water immediately. If your car is parked within walking distance, return to it immediately. Do NOT stand under picnic or other open-sided shelters. Never stand under the lifeguard chair or near metal objects (fences, poles).